Unapana Wariga-poje Bandiya enthralls Sinhalese monks, shamans and charismatics alike with his sudden rendition of a Vedda lullaby. Kataragama, 1991 photo by Patrick Harrigan. A former Additional Secretary, Ministry of Environment and Natural Resources, Sunil Sarath Perera in his talk on 'The Poetry of the Veddas' on Saturday, 18 October 2003, at Suvisuddharama Hall, Wellawatte, at a public meeting sponsored by the Colombo South Research Circle revealed that the Vedda lullaby is probably the oldest known lullaby of the world. The tradition is that Kuveni the Yakkha Queen of Vijaya sang this lullaby to lull the children to sleep. This lullaby is artistically designed and its three divisions come to life when the Vedda women sing it to lull their babies. The parts are sung to three varying tunes and rhythms. The first is highly sonorous inducing the baby that is awake to fall into sleep. Once it falls asleep the tune and rhythm change giving a soft music enveloping the baby in calmness. The final part of the lullaby is sung in a more aesthetically pleasing tune and rhythm enabling the baby to continue its sleep comfortably. 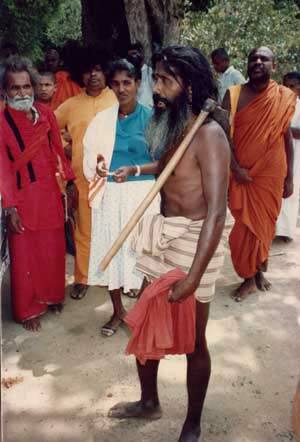 Besides the Vedda lullaby there is a rich and wide variety of Vedda songs sung at various rituals and occasions. In almost every Vedda activity there is a song which goes with it. Their honey gathering song is a typical example. Reading through the Sigiriya graffiti one notices the influence of Vedda songs and lyrics in structure and diction of some of the early Sigiri lyrics. It could be interesting for researchers to examine these trends. The gee poetry of early Sinhala classical literature may have received inspiration from the Vedda poetry through the Sigiriya lyrics in tunes, rhythm and vocabulary. Some of the finest and aesthetically pleasing songs are found among indigenous communities of Scandinavia, the Amazon region in South America, Africa, Spain, Portugal, Indonesia and other countries. The indigenous peoples of these countries are now very active in the preservation of songs and lyrics which are invaluable components of their heritage. They are very conscious of their traditions. Sri Lanka ought to follow their example. The indigenous ingredients of the Vedda culture and other indigenous communities of the country deserve preservation. The study of these traditional songs and lyrics can also enhance the quality of modern Sinhala lyricists and poets. However the Vedda poetry is definitely an important part of the Sinhala poetical tradition, said the speaker.